Thread veins are commonly found on the legs and face, it is also commonly referred to as spider veins, surface veins, broken veins or venous flares, these are small blood vessels in the most superficial layer of the skin (dermis) and have become dilated and visible, usually the dermis is 2 to 3 mmm thick. Thread veins are very common and affect up to 80% of adults. Thread veins and spider veins are different in appearance but it is similar in their causes. Thread veins are the valves located in the veins are diseased and does not fully close to prevent blood in the veins from flowing in the wrong direction (refluxing). The results in the bulging veins in the legs which is blue or purple in appearance. These can cause numbness, fatigue and pain in the legs and in rare cases can cause painful leg ulcers. Spider veins is smaller discoloured veins and has a spider-web appearance, usually these are not painful and are easily treated. We have a wealth of expertise in treating thread veins and spider veins. We approach each case with sensitivity and care. Using the latest laser and/or Dual Yellow technology, sometimes in combination with other treatments, we effectively treat thread vein and spider veins with amazing results. Here at Shadi Danin Medi-Spa we believe in an individual approach for each patient that approaches us for treatment. We begin with a consultation, during which we look at the current skin management regime, including all the products the patient may be using. The medical history of the patient is taken and an examination of the skin is carried out to assess the current situation. We then inform the patient about the products and treatments which would have benefit. Full costing for the products and laser treatments are explained at your consultation visit and the patient is under no obligation to make any decisions at that time. We always encourage people to consider the information before embarking on any course of treatment, although it is usually possible to start treatment at the same visit is so desired by the patient. 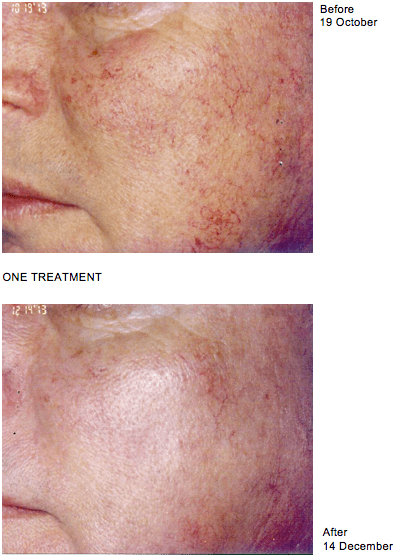 You may feel a slight redness on your skin, it should disappear after a few hours. No downtime is required, resume normal activities immediately. It is important to use sun block every day.